In preparation for the October 2016 release, when the Old e-Portfolio themes will be switched off, all blogs using those themes have been switched to the TwentyFourteen theme. No content is lost. The features of the theme which produced the profile has been lost. We recommend using the new e-portfolio plugin for creating e-Portfolios and profiles. This screencast shows how to add the new functionality to an old e-Portfolio, tidying up the old site. We are getting close to a new release on Glow Blogs. This will consist of several enhancements and some behind the scenes fixes. Although the final date and content of the release is, as usual, dependent on testing this an outline of what is planned. This will happen on Tuesday 18th October, 2016 between 16:00 and 17:00. We expect that the service will be unavailable for only a few minutes but should be considered at risk for the whole period. ‘Like’ and ‘Follow’ buttons from Yammer can be added to posts. Google Embeds, embed Google documents (docs, sheets, slides, forms, images, videos etc) on a post. 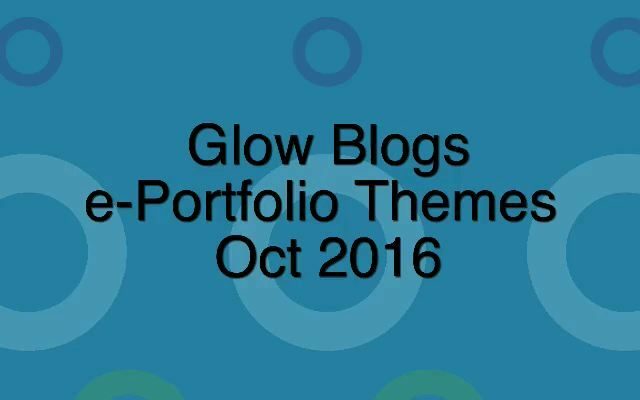 A reminder that the old ePortfolio Themes in Glow Blogs will be removed as part of our October release. Please share this widely with any schools that are using the old ePortfolio solution. There is information on how to convert an old ePortfolio to use the new plugin here the help blog. Including a screencast. NB you will not lose your old ePortfolio or any content, but the them will change to TwentyFourteen and the old profiling functionality will be lost. We are planning a new release on Glow Blogs in July. This will consist of some improvements to the service, fixes and updates. I hope to post more details soon. As part of the release we will be removing some themes that are currently disabled. These include the old e-Portfolio themes and 4 Woo themes. This will have an impact on some existing sites. Sites that using these themes will switch to the TwentyFourteen theme. We would suggest that it will be better to manually switch themes before the release. e-Portfolios cam switched to another theme and updated to use the new e-portfolio plugin. Of the four Woo themes the only one with more than a very few sites is Spectrum News. Please get in touch if you need more information. I will be sending Key Contact a List of Public blogs using the Spectrum News theme for their LA shortly. In the coming weeks there will be a Blogs release that will introduce aggregation functionality to the Glow Blogs service. This will allow teachers, students and non-teaching staff to see an aggregate view of latest blogs posts from blogs (public, private and Glow-only blogs) that they choose to follow. It will also be possible to group the aggregate view into different folders/groups which will make it easier for users to manage a large number of blogs that they are following. We envisage that this feature will be particularly useful to teachers whose pupils are using the Glow Blogs e-Portfolios. We have started a help page were you can find out more: Glow Blog Reader. There will be a new release on the Glow Blogs Service on Thursday 28th January 2016 between 4:00 pm and 5:00 pm. We expect that the service will be unavailable for only a few minutes but should be considered at risk for the whole period. The main focus of the release is a change to the Add Users screen. Blog administrators will be able to bulk add users to a blog by selecting and adding teaching groups, if they have been setup in SEEMiS. Manual addition of users to blogs will continue to be available as now. Help will be added for this change in the Glow Blogs Help blog once the functionality is live. The e-Portfolio Plugin Version 1.0 has been released. Pupils can now set up an e-Portfolio by selecting e-Portfolio from a popup on the Create Blog page. Exiting blogs can gain the functionality by activating the e-Portfolio plugin. The old portfolio them are no longer available in the theme picker. The e-Portfolio plugin make creating a profile from a series of posts much simpler. There is a new Taxonomy ‘Profile Tags’ which control which posts appear on the profile. Pupils can create as many profiles as they like. We have started producing a series of help pages on using the e-Portfolio Plugin. In preparation for the forthcoming e-portfolio update we will be retiring all of the current e-portfolios themes on Thursday 5th November 2015. The e-Portfolio themes will not be available to apply to new or existing blogs from the Theme picker. The themes will continue to work on blogs that they are already applied to. In the future we would recommend changing these themes to a more standard one and using the forthcoming e-portfolio plugin to produce profiles. At some point in the future the e-portfolio themes will be turned off altogether and blogs using these themes will revert to the default theme. We will give notice of the timing of this. The new e-portfolio plugin will be released on Tuesday 10th November 2015. This release will also add functionality to the My Sites pages so that teachers and non-teaching staff will be able to remove their membership from the sites that appear there. Please note that the update planned for Thursday 29/10/15 -16:00 to 17:00, is now in the process of being rescheduled. A new post will be added when a release date/time has been agreed. The update is planned for between 4:00 to 5:00 pm on Thursday 29-10-2015. We expect that the service will be unavailable for only a few minutes but should be considered at risk for the whole period. This is in addition to the regular scheduled maintenance release at 4:30 today. The main focus for this release is the e-Portfolio Plugin. This will change the way that profiles are created in an e-Portfolio blog. New e-Portfolio blogs will not be theme dependent. They are created from any blog using the new Profile Tags. More details are available on the help blog e-Portfolio pages. The documentation is in progress and will be expanding over the next few weeks. The current e-portfolio themes will be retired. They will continue to work on blogs that are already using them. They will no longer be available for users to choose. If you remove an old e-portfolio theme from your blog you will not be able to re-apply it. We recommend that users adopt the new e-Portfolio plugin and turn off the older e-portfolio themes. Advice on how to do this is on the help blog. The other main change will be the ability to allow teachers to remove themselves from sites on the My Sites page. We anticipate that this will allow teachers to make the My Sites page more useful by leaving e-Portfolio blogs of pupils who are no longer in their care. Please get in touch with any questions or concerns.